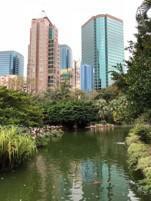 A park buried within the heart of Kowloon. The park has a small aviary along with free birds as well. It also contains a Heritage museum and right by the southernmost exit there is a subway station (public transportation).